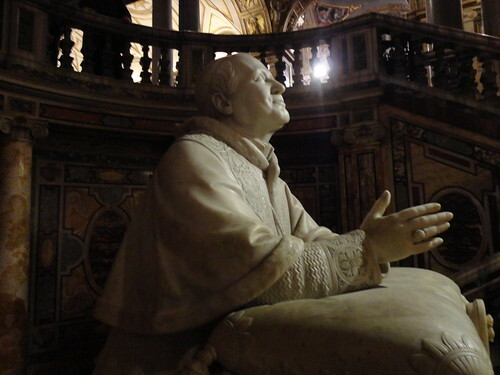 Pope Pius IX at Santa Maria Maggiore #happy365 H365/42, a photo by Jenelle Blevins on Flickr. I don’t know if today can really be a ‘happy365’ day. It has certainly been an interesting one that is for sure. I previously posted my thoughts this morning just after the news of the resignation of our Holy Father broke. I still feel much the same. 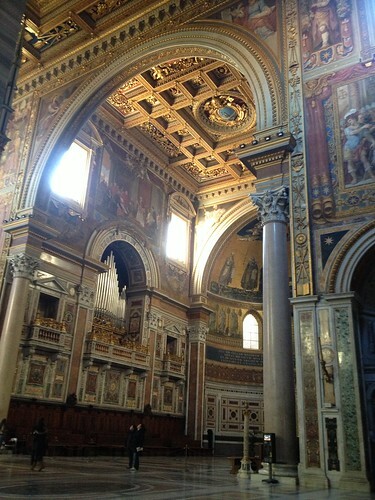 We headed out to three churches and visited Maria Maggiore last. We headed down to the pray at the Crypt of the Nativity and in the crypt is this stunning statue of Pope Pius IX. 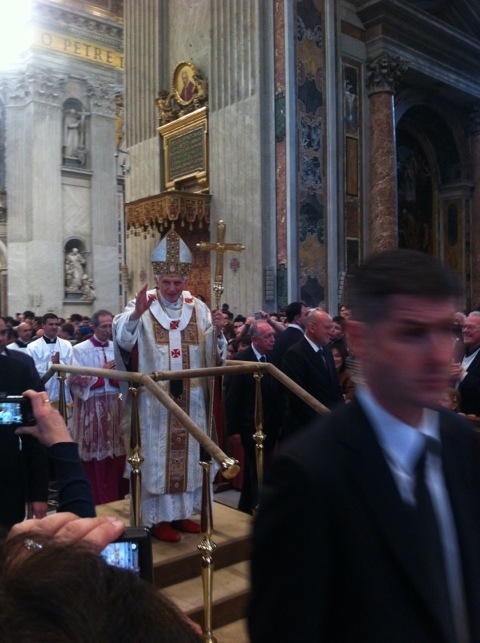 It seemed fitting to post – the longest serving Pope kneeling in prayer. On Wednesday, we had planned to attend the Papal Audience at St Peter’s and then, that evening, we had been granted tickets to Santa Sabina for the Papal Ash Wednesday Mass. We felt so blessed for this opportunity – Santa Sabina is a small church and to get the chance to begin Lent with our Holy Father was just something that we couldn’t believe we would ever have the chance to attend. Just over an hour ago, I was relaxing here in our room, Bill was taking a nap after breakfast when I saw the news of Pope Benedict’s decision to retire. My head is still spinning, we will be venturing out soon to go to the Basilica di Santa Maria Maggiore and everything feels different all of a sudden. It is a historic day and also the World Day of the Sick. 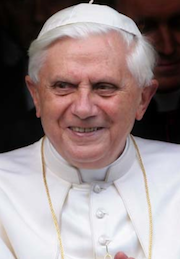 For Pope Benedict to acknowledge his own frailty is an amazing gesture. We don’t know what is going to happen on Wednesday but no doubt, it will be a day we will remember forever. Beautiful Rome! #happy365 H365/41, a photo by Jenelle Blevins on Flickr. Things are quiet in Rome on a Sunday. After Mass and a lovely breakfast we chilled out in a room for a bit and then headed out. Even the churches are closed in the afternoon so we jumped on a bus to see where we would go. After going through the outer ‘suburbs’ of Rome, we got to the last stop on the bus. This was our adventure. 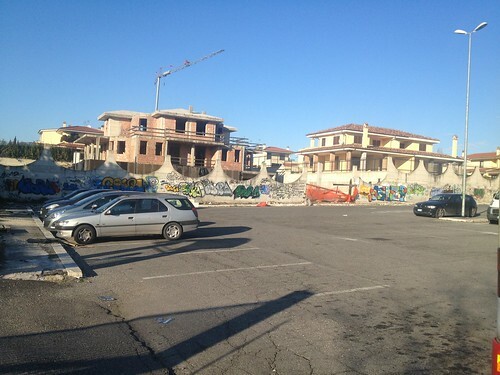 To a car park and in the middle of a building site… beautiful Rome! Santa Susanna #happy365 H365/40, a photo by Jenelle Blevins on Flickr. Our first full day in Rome and we had a HUGE day where we walked our little feet off! 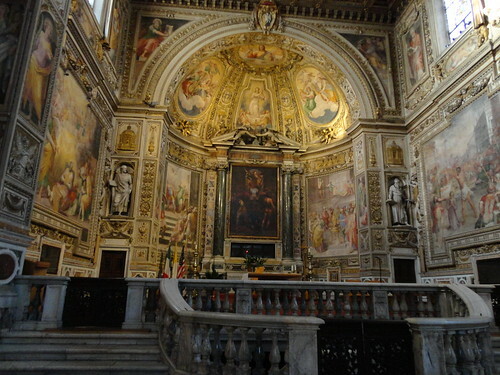 This is the Santa Susanna church which is essentially the American church in Rome. They have English Masses here and if you look very closely beyond the altar, you will see the American flag. Basilica di San Giovanni in Laterano #happy365 HH365/39, a photo by Jenelle Blevins on Flickr. Our flight was awesome – Alitalia were fabulous! We landed 5 minutes ahead of schedule at 7.55am. We were in a taxi by 8.35 and even with peak hour traffic, we were checking in to Domus by 9.15. 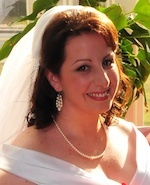 We felt so fortunate – they had our room ready! Spending 10 nights here is exciting as we were able to fully unpack. So we did that and then made a quick call to mum to tell her we are here safe and sound and after some nice hot showers, we hopped into bed at 10.30am for a nap. By 2pm we were out and about. We only had two things to do today – pick up our weekly biglietti for the metro and buses and go and visit St John Lateren to pick up our Year of Faith Pilgrim Kits and grab some pizza. St John Lateren is such a beautiful church and this is the Pope’s church! If you are in Rome, you definitely have to visit it. We didn’t mind heading back there again! After we got our two tasks done, we spent an hour sitting on bus 16 going from one end of the line to the other and back again – always the best and most relaxing way to see any city when you are tired! Our only must do tonight is to stay awake until 9pm. Happy Blizzard Day and Night to all of those in New England. Yes… I’m tracking the storm from here. I can’t help it! Ready to fly! #happy365 H365/38, a photo by Jenelle Blevins on Flickr. 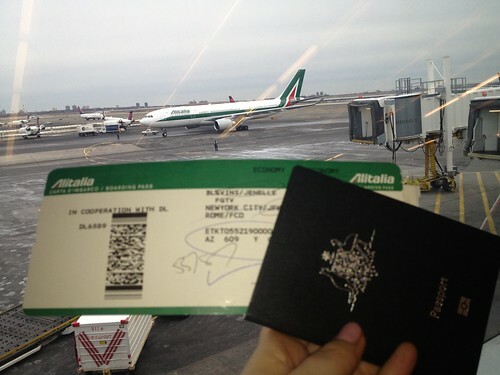 At Gate 8 – next stop… Rome! 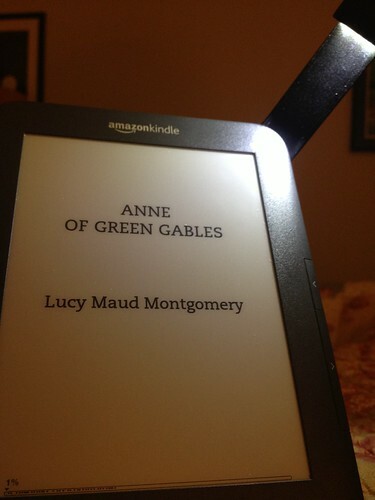 Prepping my Kindle #happy365 H365/37, a photo by Jenelle Blevins on Flickr. All packed for our flight tomorrow – getting my Kindle ready. Hoping this will help me fall asleep straight after the dinner service. A real snowflake! #happy365 H365/36, a photo by Jenelle Blevins on Flickr. We had some light fluffy snow this morning and I was out enjoying it while I waited for the bus. 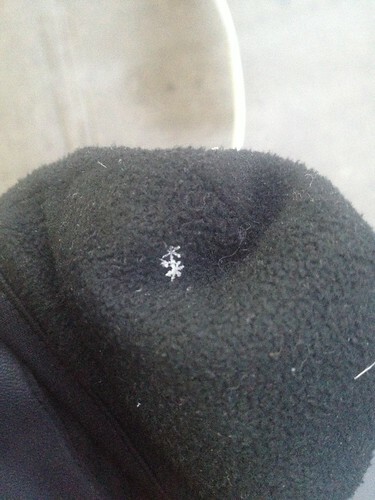 I looked down at my mitten and saw a perfect snowflake. Aren’t they gorgeous? 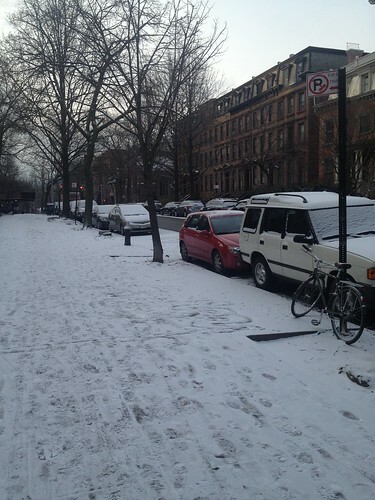 I’ve never been able to really experience ‘pretty snow’ since I’ve been here. We’ve had the wet freezing rain, blizzard conditions, sleet and the big cotton ball snow… but this morning it was just perfect and enough of a coating to make everything look pretty. 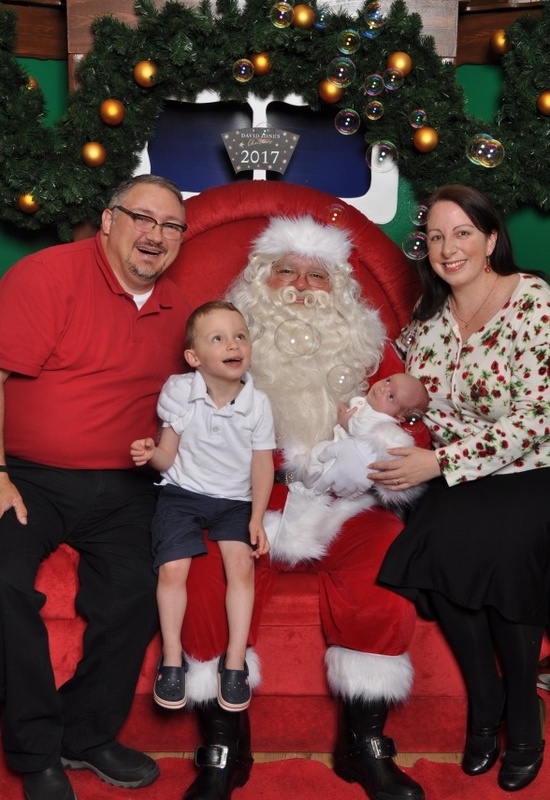 EJ and Sami – finally! #happy365 H365/35, a photo by Jenelle Blevins on Flickr. For anyone who watches Days of our Lives, today was a major day. After seven years, EJ and Sami are finally together! Sunday snow #happy365 H365/34, a photo by Jenelle Blevins on Flickr. Going to 8.30 Mass may mean giving up a Sunday sleep-in but we get first dibs on enjoying the dusting of snow that fell overnight!